Meade 10" f/8 ACF Optical Tube Assembly with the Losmandy-style dovetail. The bare essentials for an unbeatable price. We've heard your requests, and we listened. That's why we're proud to offer the f/8 OTA without the accessories for an ultra-low cost. Meade f/8 ACT 12" OTA with Losmandy Rail. We've heard your requests, and we listened. That's why we're proud to offer the f/8 OTA without the accessories for an ultra-low cost. Meade f/8 14" ACF Optical Tube. We've heard your requests, and we listened. That's why we're proud to offer the f/8 OTA without the accessories for an ultra-low cost. 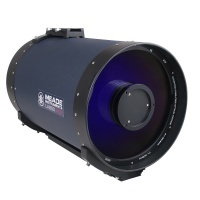 Meade 16" ACF f/8 Optical Tube. We've heard your requests, and we listened. That's why we're proud to offer the f/8 OTA without the accessories for an ultra-low cost.